Riverside dog park to undergo reconfiguration - The Resident Community News Group, Inc. | The Resident Community News Group, Inc.
Brooks Andrews shares plans to reconfigure the John Gorrie Dog Park at Riverside Park with dog owners. Beginning this month, dog owners who visit the John Gorrie Dog Park at Riverside Park will notice changes in both the large and small dog areas. The changes – which include decreasing the size of the small dog area – are necessary to accommodate a construction zone in the portion of the large dog area which extends under the Fuller Warren Bridge. The Florida Department of Transportation will use the area for the next two years to stage equipment during the I-10/I-95 improvements, which includes adding a bicycle/pedestrian path on the bridge from Riverside to San Marco. In coordination with the City of Jacksonville Parks and Recreation Depart-ment and Riverside Avondale Preservation, the Friends of the John Gorrie Dog Park at Riverside Park presented a reconfiguration of the dog park to dog owners on Aug. 11, requesting feedback. About two dozen residents attended the meeting, which was followed by the monthly park clean-up. 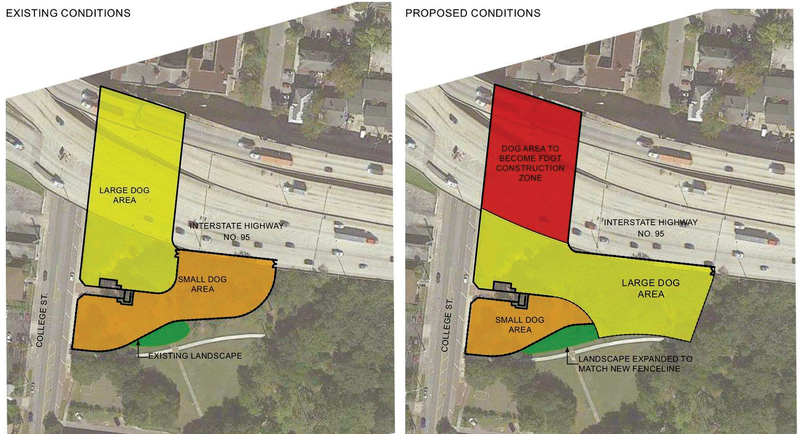 The proposed reconfiguration of John Gorrie Dog Park at Riverside Park decreases the size of the small dog area and rotates the large dog area 90 degrees to allow FDOT to use the area under the Fuller Warren Bridge as a construction zone. Andrews said the City brought in six inches of mulch, which will be replenished as needed, and the Parks Department plans to add a gravel area around the water fountains to prevent muddy ground. Andrews has also requested more trash cans and dog waste stations. Also, RAP’s ReLEAF tree committee has reviewed the park to see where they can add new shade trees. The back (or northernmost) fence line of the large dog area, which is adjacent to the Annie Lytle Elementary School property, will be moved about 40 to 50 feet closer to the dog park entrance on College Street – essentially removing the 35,000-square-foot portion of the large dog area which extends under the Fuller Warren Bridge. The large dog area, currently 50,000 square feet, will become 45,000 square feet. The east fence line of the small dog area will be moved farther east toward Park Street to accommodate large dogs, thereby decreasing the size of the small dog area from 30,000 square feet to 15,000 square feet. “Most small dog parks are smaller than what we currently have,” said Andrews. According to Nancy Powell, board chair for Riverside Avondale Preservation, the re-design of the park provides a line of sight to enable dog owners to keep an eye on their pets. The reconfiguration, designed by Jill Enz, a landscape architect with the Parks and Recreation Department, will not cut into Riverside Park. Powell said by re-using existing fencing, including the decorative fencing, it will be very cost-effective for the City. After FDOT has moved the fence line, the City will begin to reconfigure the dog park and will minimize down-time by only shutting down one area at a time. In two years, after FDOT has finished its improvements to I-95 and the Fuller Warren Bridge, the space under the bridge will be returned to the City, but it may or may not be re-used for the dog park, said Andrews. It may become part of the Emerald Necklace bicycle/pedestrian trail or be used for other purposes. Dog park clean-up days are held the second Saturday of each month, 9-11 a.m. The Friends group also plans to offer a dog etiquette workshop as there have been issues with dogs that appear not to be “socialized,” said Andrews.